"The Cycle of Cosmic Catastrophes tells a fascinating, remarkable, and scientifically convincing story that will change how we look at our world. The important conclusion that catastrophes like this could happen again at any time should inspire a united global effort to confront this serious danger to Earth." "Reads like a mystery novel while presenting compelling hard evidence for a cosmic catastrophic 13,000 years ago that rendered mammoths and many other large North American animals extinct. For the last twenty-five years, I have urged greater awareness of such cataclysms, and this book will aid in misunderstanding such events. I'm happy to see serious research presented in such an easy to read style." There are a number of puzzling mysteries in the history of the earth that have yet to be satisfactorily explained by mainstream science: the extinction of the mammoths and saber-toothed tigers, the vanishing of ancient Indian tribes, the formation of the mysterious Carolina Bays, the wild temperature swings at the end of the Ice Age, and the cause of huge underwater landslides that sent massive tsunamis racing across the oceans millennia ago. Eyewitness accounts of these events are chronicled in rich oral traditions handed down through generations of native people. The author's recent scientific discoveries link all these events to a single cause. In The Cycle of Cosmic Catastrophes Richard Firestone, Allen West, and Simon Warwick-Smith present new scientific evidence about a series of prehistoric cosmic events at the end of the Ice Age. 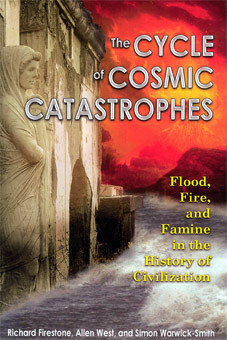 Their findings validate the ubiquitous legends and myths of floods, fires, and weather extremes passed down by our ancestors and show how these legendary events relate to each other. Their findings also support the idea that we are entering a thousand-year cycle of increasing danger and possibly a new cycle of extinctions.